Sometimes you find a gem at local markets. This weekend we found one. 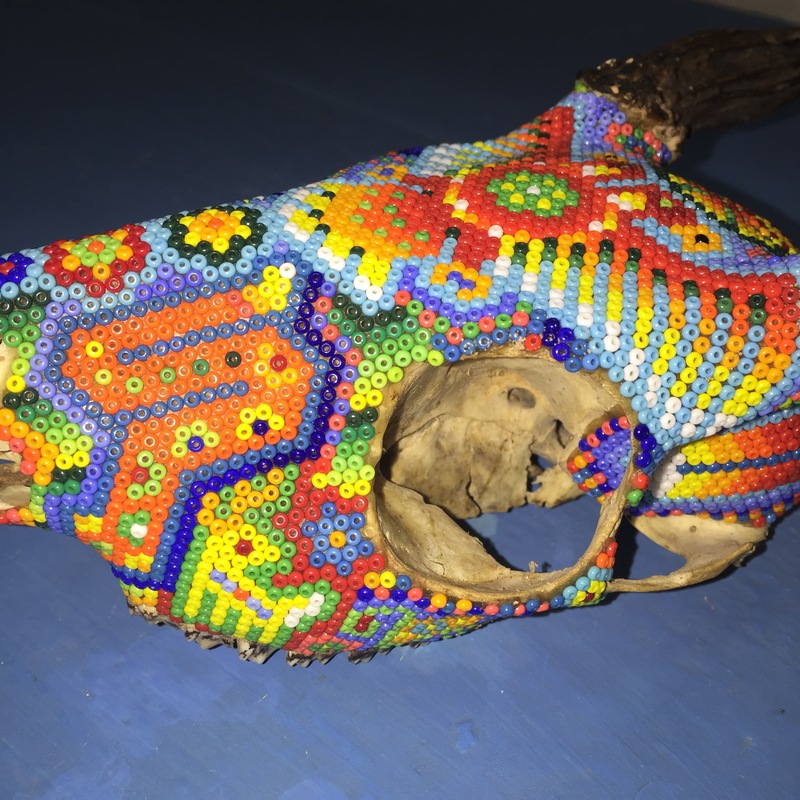 A small, very old, deer skull adorned with traditional Huichol Art from the Huichol people who live in the states of Jalisco, Durango, Nayarit in Mexico. Now items are decorated with small colorful beads, but long ago they used to be decorated with yarn. The art objects range from ceramic vases, figures and animals, to actual bone artifacts. 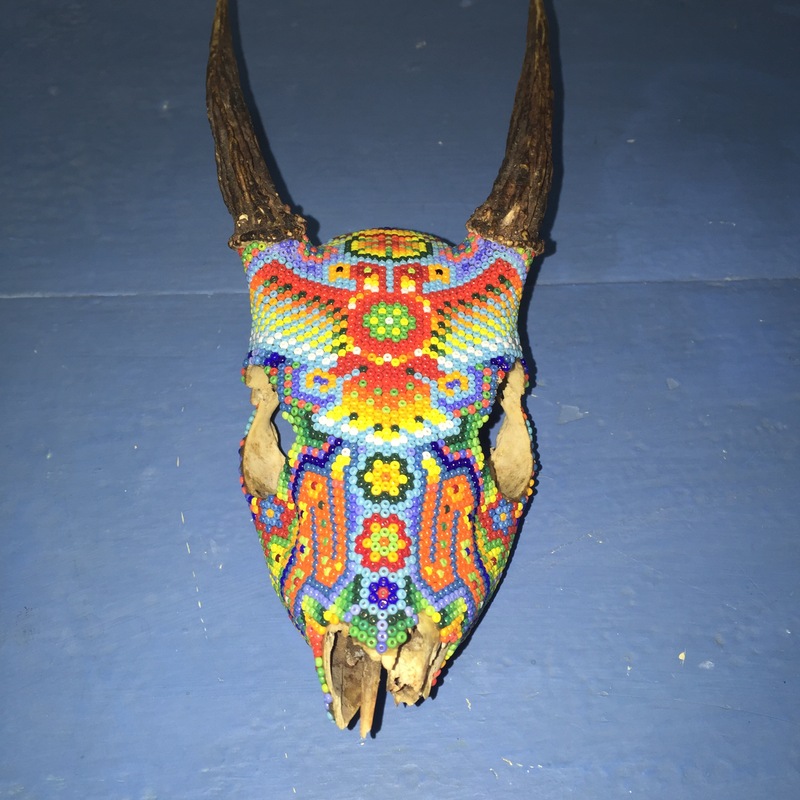 With only 50,000 Huichol left, and far fewer able to reproduce this craft, art objects like this are becoming very hard to find. 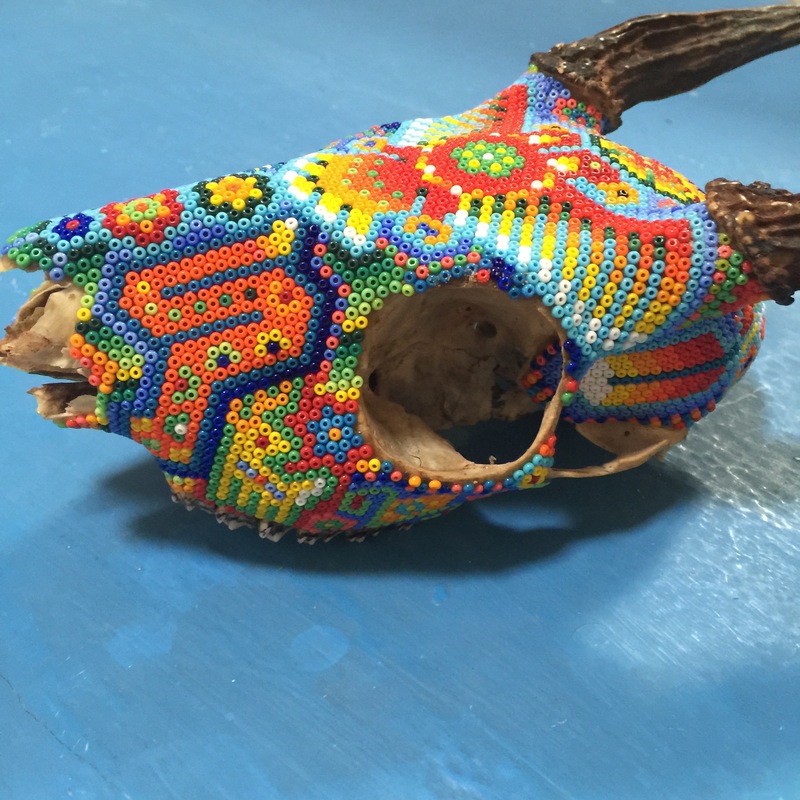 Most outsiders are not aware that most Huichol patterns and designs have religious and cultural significance. These patterns can be found on a wide variety of objects including carved and beaded on masks, gourds, musical instruments and embroidered on clothing objects such as belts, sashes, side bags, and more. Most have religious significance and many are influenced by visions which occur during peyote rituals. 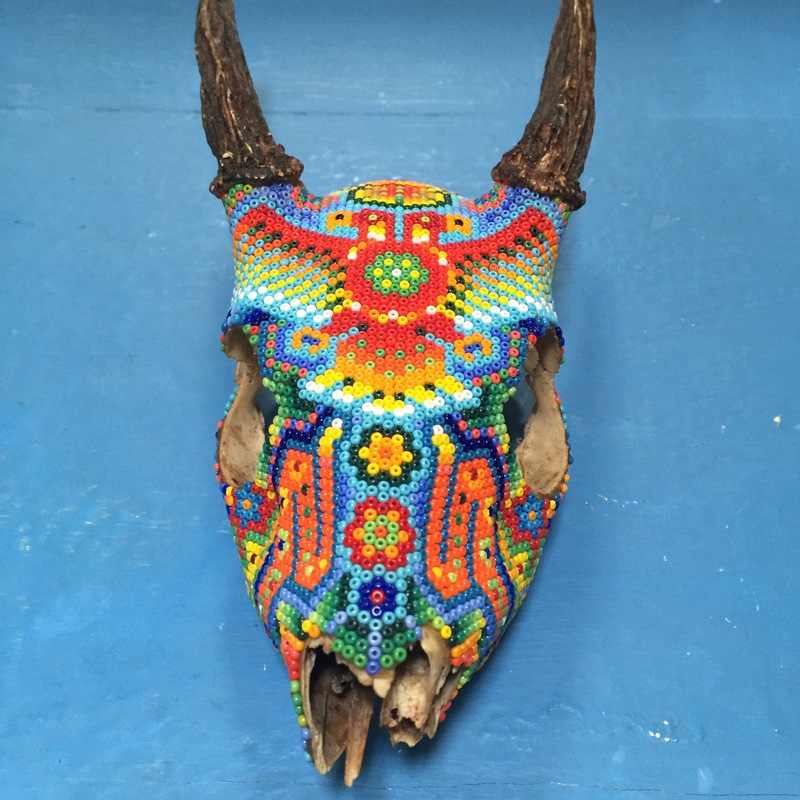 Much of what is known about Huichol designs and symbols was put together by Norwegian explorer and ethnographer Carl Lumholtz in the late 19th century, but Huichol art and decoration has since become more varied. However, plant and animal motifs remain the most common and most retain their original meaning. When ceremonial or religious items are made, all aspects of the making from materials to colors to designs are important as they are identified with particular gods and meanings. Mesquite and the color reddish brown belong to Tatewari, who is of the earth and the wood of the Brazil tree is related to Tayuapa or “Father Sun.” Symbols such as the golden eagle and macaws are related to Tatewari. Shapes such as the deer, coyote, pine tree or whirlwind can be associated with Tamat’s Kauyumari, who shaped the world. The salate tree, the armadillo and the bear are associated with Takutzi Nakahue, the mother of all gods and of corn. The toto is a small white flower with five petals associated with the rainy season. Sashes and belts often have designs that mimic the markings on the backs of snakes, which are also associated with rain, along with good crops, health and long life. The zigzag lines that emanate from all living things represent communication with the deities. The butterfly motif is reminiscent of the Itzpapolotl or Obsidian Butterfly, a principal deity of the classical Aztecs, who the Huichols claim as ancestors.